When you first login as a Trucker, you will be brought to the . Currently there are no jobs on the Job Board. Once a job has been created and sent to your hauling company, you can view it on this page. The image below shows one job on the Job Board. Contractors are able to create jobs and post them to the Job Board. Truckers are able to bid on these jobs. The Job Board shows information about each specific job. Job # - This is automatically assigned by TruckIT. In this example it is the 293rd job ever posted to the Job Board. Customer Ref - This is the reference the Contractor uses for their own personal use such as bookeeping, etc. Date - The start date and time for the job. This is when your trucks will be expected to arrive at the jobsite. Type - How materieral will be measured. This can be Ton, Load, Hour, Cubic Yard, etc. Pick Up Site - Where the material will be loaded onto your truck. Drop Off Site - Where the material will be delievered. # Trucks Open - Trucks needed to fill this job. Open Bids - The number of trucks you have chosen to fill this job. $ Amount - What you will be paid based on quantity and price per unit. After a job has been posted, you are given two options: Fill and Details. Clicking will bring up all information about the job as shown below. Details also shows trucks that have a pending bid on the job and truck bids that have been accepted to work this job. Clicking will bring up the menu shown below. This is where you add truck bids to the job. Using the dropdown menu, select the truck you wish to bid on this job then click . Your added truck will appear as shown below. Now that you&apos;ve added a truck bid to this job, you can choose to change your bid or remove this truck. 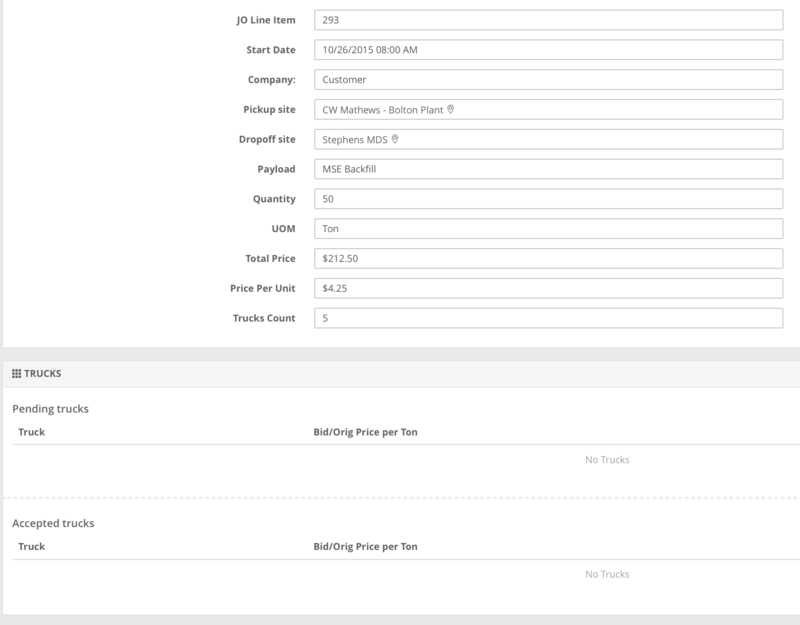 You can change your bid by clicking the highlighted bid amount next to the original price. After changing your bid, click to confim. Your new bid will now appear as shown below. You are able to bid using any of your trucks as long as they are available for the job start date. In this example, the job is requesting 5 trucks and the Trucker has 12 trucks available. You can save this bid with only 1 truck or you can add additional trucks to bid on this job. After you have added your truck bids to this job, click . You will be directed back to the Job Board. In the image above, notice the number in Open Bids is now 5. This is the number of truck bids you have on this job. Truck bids waiting to be accepted will be displayed in the Pending Jobs tab. 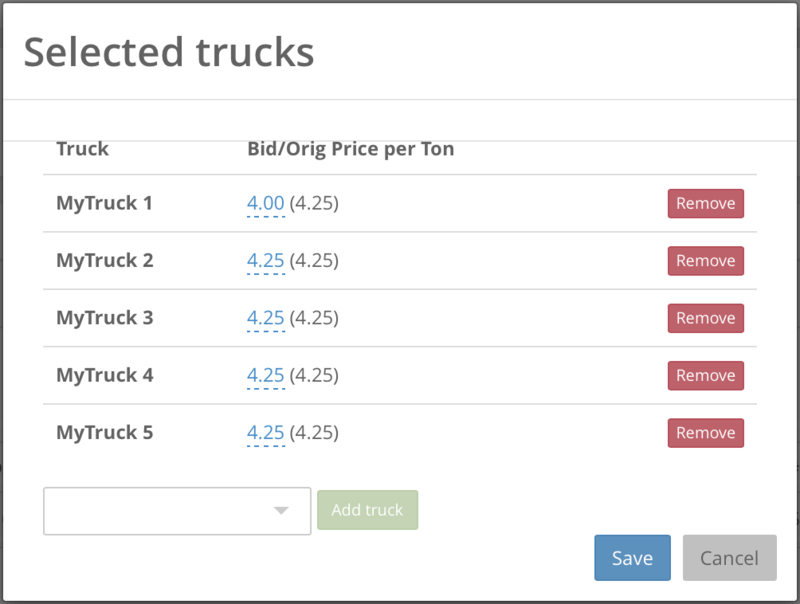 This is where you can view your current pending truck bids for each truck. This is also where you have the option to cancel a bid and view details for the job. 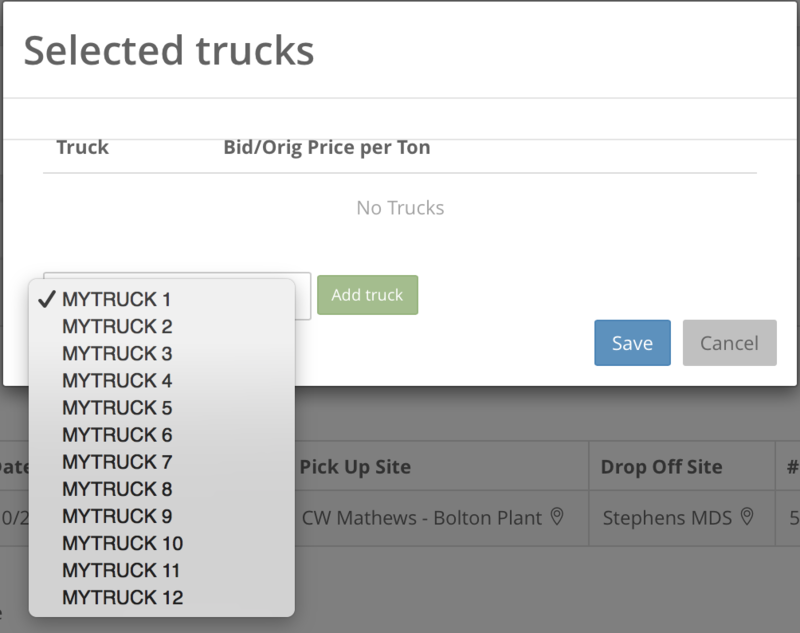 You can also remove truck bids from the Job Board by clicking then clicking then clicking . You have successfully bid on a job!